Rockwell Elementary was recently named a National PTA School of Excellence for the 2018 -2020 school years. 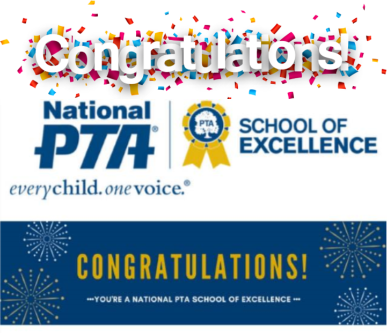 National PTA’s School of Excellence program supports and celebrates partnerships between PTAs and schools that work to improve the educational experience and school environment for every child. As a National PTA School of Excellence, at Rockwell, families feel welcomed and empowered to support student success, and PTA is a key partner for continuous school improvement. The School of Excellence program provided guidance to assist our school in engaging families in school decision-making, and help our school build inclusive policies related to education, health, safety or the arts. Becoming a National PTA School of Excellence began with the joint commitment of PTA and our phenomenal administrative team to work together to welcome all families, communicate effectively, support student success, speak up for every child, share power and collaborate with the community. Our school has successfully mastered these commitments and we applaud everyone for doing so. The path to excellence is a journey, not a destination, and we encourage your continued participation toward our goals, as this distinction places our PTA in the running to become a Phoebe Apperson Hearst Award recipient, which recognizes success in integrating family-school partnerships. We are extremely proud of the work that we have done to enrich the educational experience and overall well-being of all students. Thank you for your commitment to our school community. Thank you for helping us reach this noteworthy milestone for our school and community.